Mom life. If I could share ONE WORD that we could ALL agree upon it would be LAUNDRY. I mean Mommas…. am I right or am I right?! Since having Brody James (he’s 7 months old now!! #hugme), I’ve learned REAL QUICKLY how important it is to get a laundry game plan. I actually had to learn this the hard way, as I started to drown in the never ending hole that was LAUNDRY. 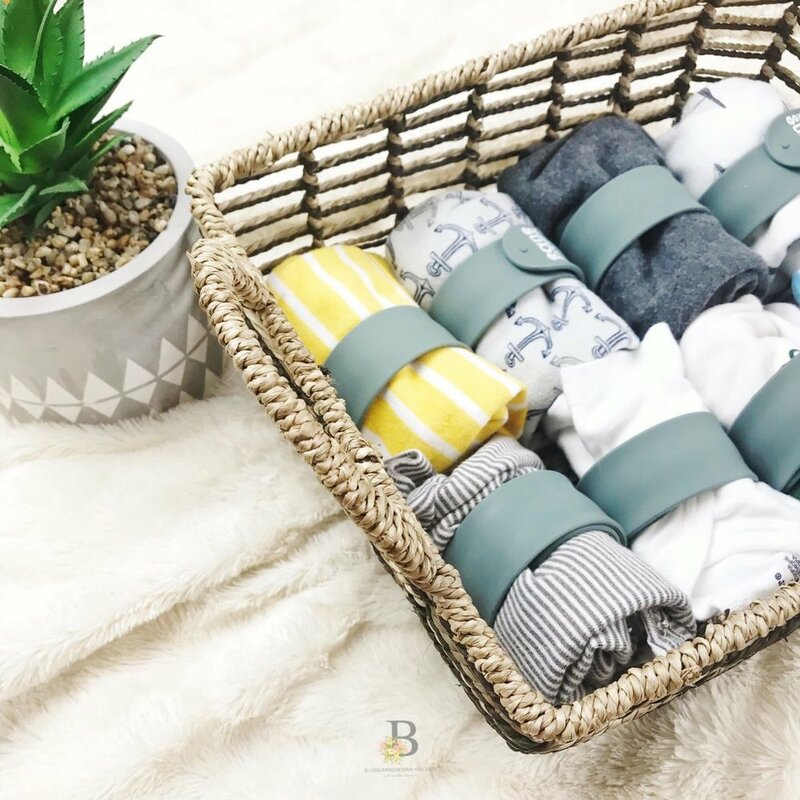 Likewise, I’ve heard from SO MANY OF YOU within the Blossoming Mommy And Baby Community on the frustration that comes from never being caught up with laundry. Ladies, I GET IT! BUT… I’ve also mastered this solution and YOU CAN TOO! RINSE. WASH. DRY. REPEAT. Let's dive in! Whether you have diaper blow outs and dirty bibs like me (all day, everyday ) or you’ve got muddy soccer pants from your 8th graders’ game, today’s blog will help you ONCE AND FOR ALL conquer the “dreaded” laundry room. Okay, Mommas. SO. The first thing I did to up my laundry game? I listened to our chief of staff (Courtney). She called me out and revealed the LAUNDRY TRUTH….as any good friend would do …. “Jenni! You HAVE to do one load of laundry a day. Wash, dry, fold, and put away. Just make it apart of your routine.” So- off I went. The first day was tricky because I had to CATCH UP. I was “that Mom” who had 8 piles of laundry on her floor… all washed and all dried, but none folded and none put away. YIKES. So, after a little elbow grease, a coffee break (or two), newborn snuggles, and a Parenthood binge on netflix… I was FINALLY ahead. You guys- to this day I still follow the one load a day rule and I highly encourage you to do it too! Just get started, wherever you are at right now. Get all the clothes washed, dried, and folded… then put them ALL away. In addition to following the one load a day rule, I also implement these two laundry strategies because let’s just be real…. mom life is BUSY and MESSY and at times chaotic, so when we can streamline certain areas of our lives and make things easier… you better believe we’re gonna do it! 1. Have a laundry basket for each room. I have a laundry basket in Brody’s room, our guest bedroom, our master bedroom, and the laundry room. Laundry baskets are relatively cheap, so just grab a few on your next Target trip and you’ll be good to go! This #momhack is so easy and will help keep your home tidy. Have your kids throw their laundry in THEIR laundry basket, then, when you’re ready to do your load for the day, just collect everyone’s baskets. When you’re ready to deliver, place folded clothes into the baskets and THEN back into everyone’s rooms. 2. Use GOOD, quality laundry products that don’t cost a fortune, are safe for your body, and actually WORK. Ahh… this! Before finding Molly’s Suds, I was the Mom who had wire baskets full of multiple cleaning products- soaps, scrubs, whiteners, softeners, sheets… basically anything and everything the laundry market puts out there. Here’s the thing, Mommas. When you have good, quality products, you don’t have to waste your time, money, or energy on the multi-step process it takes to get clothes clean. Also, since having Brody, I am SUPER AWARE of what I wash my family’s laundry with because you guys know that chemical infused detergents and other laundry products can leach into our body via the clothes we wear and the items we use on the REG (think sheets, towels, blankets, etc). This is why I am SO passionate about sharing healthy, safe brands that I not only use and enjoy, but genuinely recommend for YOUR families as well. If it’s not already, Molly’s Suds needs to be in YOUR LAUNDRY ROOM. Molly’s Suds is a SAFE BMAB approved brand that provides my family and yours with safe, chemical free laundry products that actually WORK. They’re committed to being safe for our planet and our families and show this through their commitment to high quality ingredients and top notch integrity. Their products are formulated with a ‘no-compromise’ attitude and they use simple, safe ingredients that are earth + plant derived which allows our Momma hearts to rest peacefully at night knowing that what we wash our laundry in isn’t going to leach out chemicals, carcinogens, or endocrine disrupters into our bodies or worse, our children's. Here’s a fun fact for you guys! Molly’s Suds products are all Certified-Cruelty Free by Leaping Bunny and all of their detergents and cleaning products are Certified Vegan. To read up on all the ingredients Molly’s Suds uses- check em’ out here! Before we go, please hear my heart. Brian and I struggled with infertility for 2.5 years prior to getting pregnant with Brody. As a medical professional, I truly believe the influx we’re seeing with toxicity and our environment today play a large role not only in infertility and pregnancy, but also with many other health conditions. Molly’s Suds is committed to the health of my family (and yours) and reminds us of this by the two little footprints on the back of every product. Those footprints are indeed Molly’s. 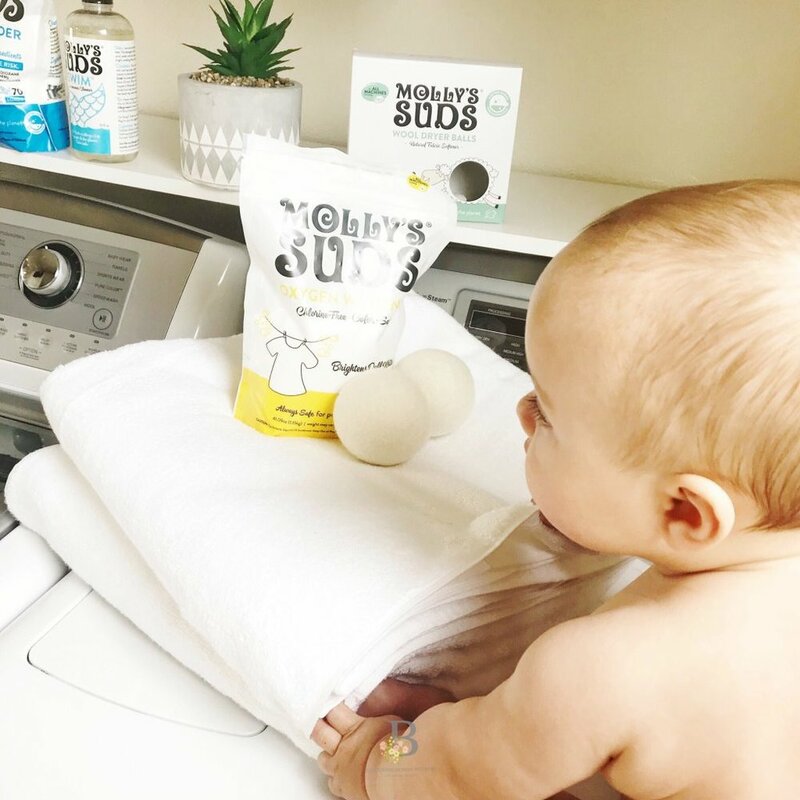 The founder of Molly’s Suds is a pediatric nurse (and Mom) who used the loss her daughter Molly in 2008 to inspire her in creating this amazing brand and safe, family friendly laundry products. What an honor it is to support such a family centered brand. Visit www.mollyssuds.com for home cleaning DIY recipes, laundry & stain-fighting tips, and their Laundry Room blog… along with a lineup of incredible products! Now GO! Overhaul YOUR laundry room, Mommas! Use code BLOSSOM25 for 25% off your Molly’s Suds Order TODAY!